As we went to press today with the Daily Social Media Curation review, we received this from the team @ +Business Insider on the current Twitter Predicament--it is a developing story that we will be assessing as our team utilizes Twitter for the Daily World Roundup--It is quite a development that Marc Andressen is eyeing Twitter--and yes 300 Million Users (and we are one of them!!!) --is quite a prize!!! As we await the Feburary 10 earnings annoucement (and also Alphabet (Google's Parent later on today), we are especially keen to seen how Silverlake will help with this especially as they've got their hands full with the Dell/EMC merger especially as we're witness to challenging economic realities. Potential buyers are circling around Twitter again, according to a report by Jessica Lessin in The Information. This time it's big-time tech investor Marc Andreessen in conjunction with private equity firm Silver Lake. Because Twitter, despite all its problems, still has 300 million users and is on track to book $3 billion in revenue this year, up 50% from last year. 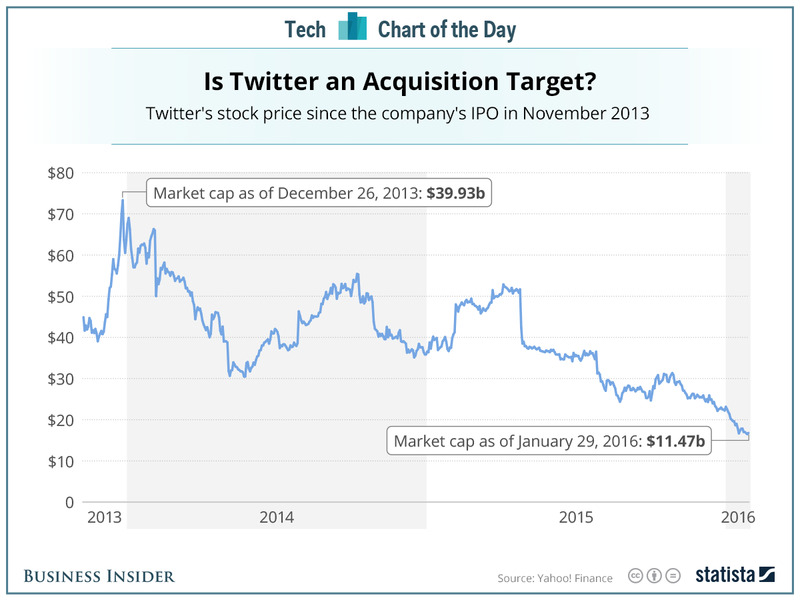 Plus, as of last Friday, Twitter stock was cheaper than it's ever been since the company went public, as this chart from Statista shows. It's up about 8% this morning, but still well below its IPO price, with a market cap under $13 billion.